The Tumbler Ridge Aspiring Geopark aims to enhance the visitor experience in Tumbler Ridge by providing interpretive signs along the hiking trails developed over the past fifteen years by the Wolverine Nordic and Mountain Society. The trail to Quality Falls, being close to town, fairly short, relatively easy, and leading to an attractive waterfall with interesting geology, ideally lends itself to such interpretation. What also makes the Quality Falls trail unique is the research done at this site by scientists Darren Irwin and David Toews from the University of British Columbia which led to the splitting of the Winter Wren into two species (Winter Wren and Pacific Wren). The eastern and western birds have quite distinct songs, and they were encountered singing close to each other right here at the trailhead of the Quality Falls trail. The differences in song are as distinct in this contact zone as they are in populations far away. Specimens were mist-netted and released, and blood samples obtained for mitochondrial DNA analysis. The results show that these two species separated from each other about 3 million years ago. The reason for this separation was the ice age glaciations, during which most of Canada was covered by ice. 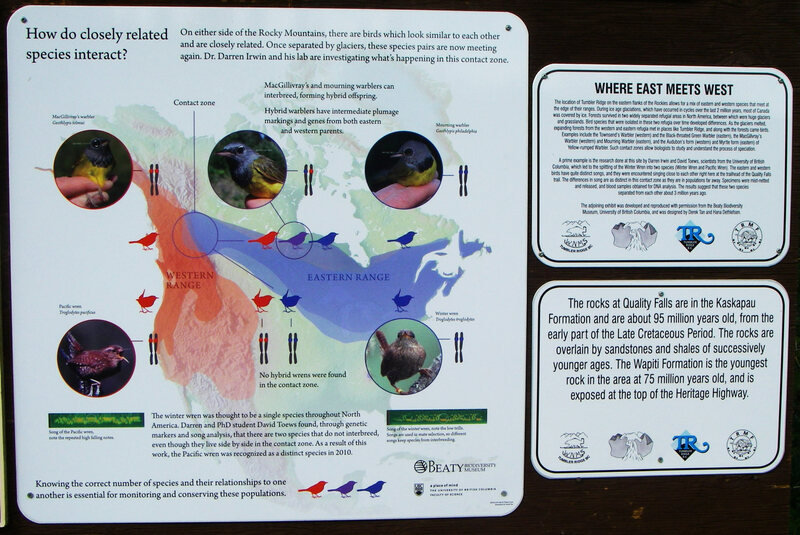 In addition, eight new signs have been installed in the area close to the falls, interpreting the geology, fossils and wildlife, and Carmen Drapeau did a great job repainting the trailhead map, which has been reinstalled. Together these additions have taken the Quality Falls trail to a new level for the enjoyment of tourists. A Geopark involves partnerships, and this partnership with the Beaty Biodiversity Museum is a prime example of such a successful endeavor. Similar partnerships are being forged with UNBC, Simon Fraser University, Kelly Lake Cree Nation, Treaty 8 Tribal Association, and other institutions, all of which will result in benefit to Tumbler Ridge and the Peace Region as the Tumbler Ridge Aspiring Geopark’s bid to become the first Global Geopark in western North America undergoes final evaluation.